I’ll preface this section with the warning to have tissues on hand while reading this book, because it’s very emotionally charged. Following the lives of a family living through a devastating bushfire, from the lead-up to the evacuation to the aftermath that is confronting in its honesty. This is a book that evokes a sense of place and the landscape is as much a character as the people in the story. As a class, we listened to this via Storybox Library, with author Ella Holcombe reading the story, and it was an experience. Most of my students are too young to remember the bushfires themselves, but many of them know older students or siblings who do, and the conversations this story prompted were as sobering as they were deep and meaningful. It’s well worth taking the time to unpack this with students. I’ve waited a long time to teach a year level that Skullduggery Pleasant would be an appropriate class read for, and I have to say, nothing has made me happier. We’ve spent a lot of time this week reading this book (we’re in to chapter 4) and since I started it we’ve not had a day when my students haven’t asked for us to read a bit more. And even though we’ve read some intense scenes, we have a good giggle every few minutes. For the uninitiated, this book follows 12 year old Stephanie as she stumbles onto the world of magic and the skeleton detective, Skullduggery Pleasant, after the death of her uncle. It’s part fantasy and part mystery, and Derek Landy is very clever with his dialogue and characterisation. It’s a lot of fun. I adore Peter H. Reynolds’ books, and Ish is no different. It is about a young boy named Ramon who loves to draw until one day a mean comment leaves him doubting his abilities to the point where he gives up. That is, until he realises how much his art is loved by another. It is a book that celebrates artists, but most importantly, that ‘perfect’ doesn’t mean ‘best’ and that anyone can draw anything-ish! Follow up activity: After reading, we had a big chat about the change in Ramon’s mindset throughout the story, from growth to fixed and back to growth. We discussed the difference between criticism and constructive criticism, as well as our own personal strengths, skills and qualities. For something a little fun – and because we’re all still getting to know one another – we also completed a page from Big Life Journal’s Growth Mindset Printables Kit (the Take Chances, Keep Going drawing challenge). I’m a bit late on the train for this book which was released back in 2008, but I’m glad I read it this week. Dennis is an ordinary boy living an ordinary life with his dad and his older brother; but his ordinary life is about to change when he discovers that if you open your mind and take a risk, life can be anything but ordinary. This is a wonderful book that challenges gender stereotypes, promotes male-female friendships and celebrates what it means to be uniquely you. We’re over half-way through the Summer holiday break here in Australia and for a lot of teachers that means getting back into the swing of things. I know I’ve spent more time that I normally would in at school preparing my classroom (one of the hazards of changing rooms and year levels), but I’ve also had the best opportunity to start thinking about the books I’ll be sharing in my classroom in 2019. I’m hoping this year to share a post every Friday with a list of some of the books my class and I have read together in the hope that you, my wonderful teacher friends, might find a book that’s new to you, or one that will fit topics you’re teaching. Once school goes back, these lists might be a bit more ‘thematic’ but since it’s the holidays I thought I’d share 4 new picture books I’ve added to my collection recently that I’m very excited to share with my class throughout the first term of 2019. Some of you will be very familiar with Peter H. Reynolds other books, The Dot and Ish, but this book was one I thought would be perfect for my 3/4 students. It’s about Jerome, who loves to collect words. He has notebooks and notebooks full of them, and then he discovers how to put these words together, and how to share them with others and it’s just beautiful. This is a wonderful book for vocabulary and for inspiring students to look for new words all around them. I stumbled upon this in a bookstore and had to buy it. Ara is a girl who loves numbers and maths and wants to count all the stars but isn’t sure how to do it. She visits Google’s Innovation Plex and meets with four (real-life) female engineers and learns about their jobs and learns new ways to approach solving her problem. This is a great book for girls in STEM fields, as well as looking at problem solving and coding. One day, Lola’s teacher asks her students to draw a picture of where their families emigrated from. It’s a project that gets everyone excited – except for Lola, who was so young when her family emigrated that she can’t remember the Island her family called home. What follows is Lola’s conversations with family and friends to unlock their memories – which are at times joyful, heartbreaking, scary and lovely. This book celebrates cultural diversity, family and identity, and is just a gorgeous book to share with others. This beautifully illustrated children’s picture book explores the history of the first moon landing through the eyes of Moon Mouse, a young mouse who dreams of reaching the moon. It’s a story told in pictures and words and every page has lots of detail to unpack, and the last few pages have short paragraphs on the history of those people who made it possible for humans t land on the moon. It’s perfect for discussion determination, persistence and patience, as well as following your dreams and the history of space flight. What are you reading this week? Feel free to share your reads in the comments or add you blog link below for others to follow along! It’s been a while since I last posted on the blog and I’ve been super-busy with a lot of things, but I had an idea (after discovering the magic of BookTube) and thought it might be fun to film a video sharing my Top 5 picture books by different authors or on different topics. If you’re anything like me, you may have difficulty picking just five books in any category. It’s virtually impossible for me to narrow down any book category, and my first theme – books by Mem Fox – was no exception, but I did it for the sake of the video. Mem Fox is an iconic Australian author who has written numerous books for children and they’re all wonderful. Not only beautiful stories, but wonderful characters and language that is so much fun to read aloud with kids. So, without further ado, here are my Top 5 Mem Fox books… although I’d talk about ALL of them if given half the chance! What are your favourite Mem Fox books? 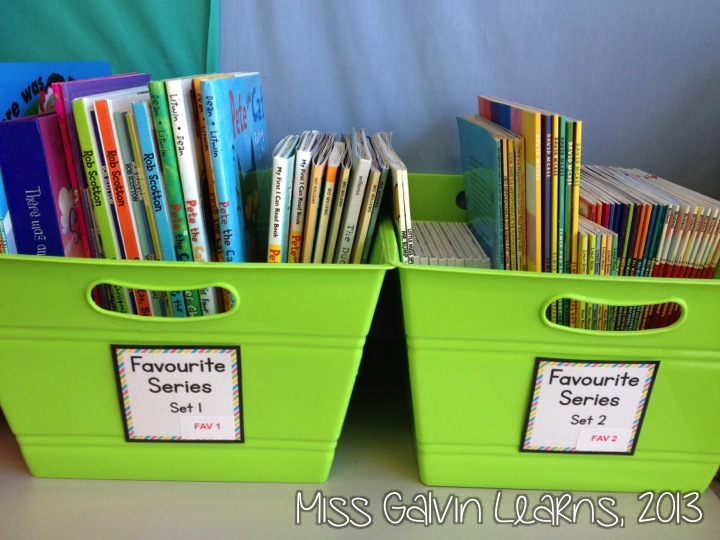 Let me know in the comments – I’d love to know which ones are nostalgic favourites or class favourites. If you’re interested in some activities or crafts based on these books, be sure to let me know. Also, if you’re interested in this Top 5 Books becoming a regular feature, what authors or book themes would you be interested in seeing? I hope you’re all having a wonderful week and I’ll see you soon! Did You Take the ‘B’ From My _ook? If you haven’t seen this book, RUN (don’t walk) and grab yourself a copy because it’s run of the most enjoyable books I have read with my class so far this year. If you’ve followed my blog for any length of time, you may be aware that I love children’s literature. I love books that make kids think and feel and laugh. Did You Take the B from My _ook? by Beck and Matt Stanton definitely makes them think and laugh. They also argue back with you, which is the most fun a teacher (or parent) can have when sharing a read aloud story, and this is one of those books that must be read aloud. Trust me on this! For those of you who are familiar with the book This Is a Ball (also by Beck and Matt Stanton), this is a book where the adult reader is given instructions by the author prior to reading. In the case of Did You Take the B from My _ook? you love the letter ‘b’ and you’re going to sneeze and all the ‘b’s’ will be blown away. Then begins the really fun ‘conversation’ that you have with your child or class of students as you read all the words on the page without saying the sound ‘b’ in any words that begin with ‘b’. It is both hilarious and tricky and a fantastic jumping off point for conversation with children who argue you back at you and tell you that _all should be ball and _utterfly should be butterfly and so on. When I first read this to my class (a group of twenty-three 4-6 year olds) I had two parent helpers in the classroom. They were in stitches, too, mostly because my class were desperately trying to convince me that I was saying all the words wrong all the time. By the time I finished reading it I had a little chorus of “Read it again, Miss Galvin!” going on (which I would have if it hadn’t been recess time!). Make a list of words from your Sound of the Week and take that sound away from the beginning of words and read them aloud as a class. 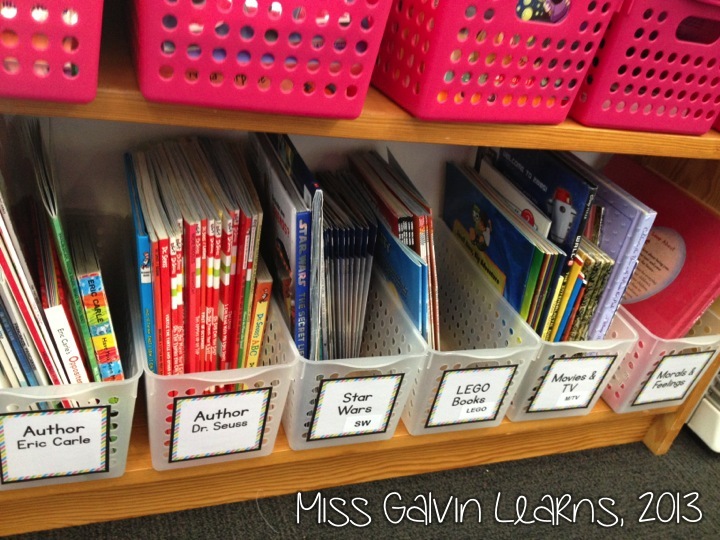 Take away the first sound in students names and read them aloud. Create an alliterative sentence using a particular sound (or your Sound of the Week), take away that sound and read it aloud. For much older students, you could have them create their own version of the story with their favourite sounds and then have them share them with younger students. So, thank you to Beck and Matt Stanton for (again) producing a highly entertaining book with wonderful learning concepts embedded within it. This was such fun to read and I can’t wait to read it again with my students in the future! If you have any favourite read aloud books, be sure to share them with me in the comments below. I’d love to know what they are! 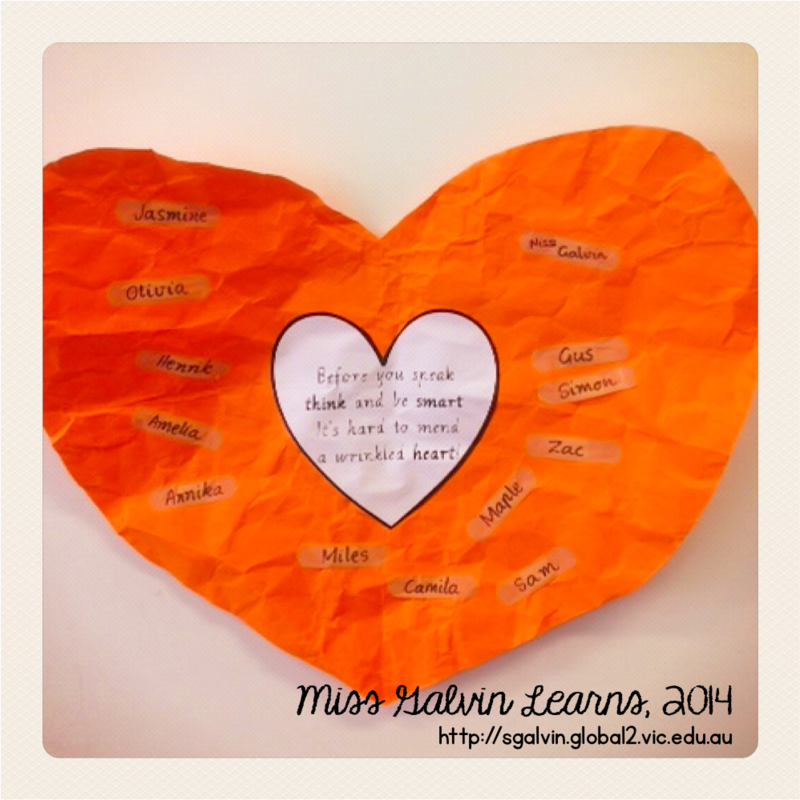 Until next time, happy teaching, friends! I’ve been teaching letter writing to my Grade 1 students over the last few weeks and we had a bit of fun with a great story called Dear Greenpeace by Simon James. For those of you who have never read the story, it’s told through a series of letters between a little girl named Emily and Greenpeace. Emily discovers a whale living in her pond and writes to Greenpeace to learn about (and how to look after) her whale. It’s a very sweet, very endearing story, with a great environmental message, too. My kiddos just adored it. We used it as a springboard for writing imaginative letters to each other about wild animals living in strange places (e.g. : polar bears in freezers, dogs shaving on toilets, snakes in pipes, monkeys under beds, etc). They had SO MUCH FUN brainstorming their ideas and their letters turned out great, too. I’ve made up a couple of template pages for you to use if you’d like. Click on the sample letter below to download the letter and two template pages! I’m linking up with Paula from Paula’s Place this week for her Storybook Sunday linky. I’ve been meaning to link up for the last few weeks and unfortunately things have just piled up. This week, though, I do have something to share, inspired by a LOT of people in blogland and on Pinterest. So, after some research, I discovered the book Chrysanthemum by Kevin Henkes. And before all of you fall out of your chair going “OMG, Stef have you been living under a rock?! !” I’ll let you in on a secret. I’ve never had so many of these friendship/hurtful word issues at the start of the year before. I just haven’t, and so anything that’s come up has been dealt with on an individual basis. But, this year… yeah, I think it’s going to be an on-going topic we need to address. Anyway. I didn’t own a copy of the book – or know anyone who had a copy – so I bought it in iBooks and figured I’d share it on the IWB through Airplay (this caused some minor issues in attempting to find Airplay in the new iOS7, but that’s beside the point!). Now, the activity I found on Pinterest (this one here, but unfortunately it has a broken link!) was a scrunched paper heart activity, where students took turns to scrunch up as we read the story. The instructions I gave to my students is anytime someone says something hurtful to Chrysanthemum you’re going to scrunch up the heart and pass it on. By the end of the story the heart is really and truly crushed and we all had a go at trying to smooth it out to return it to it’s former perfect state. The kiddos discovered that they couldn’t – and some of the reactions were quite profound. We talked about how whenever we say things that are hurtful and mean we’re scrunching up someone else’s heart and it can never be undone – even if you say sorry or you didn’t mean it. After that we talked about ways that we came up with ways that we can try to not hurt other people’s feelings/help people who are feeling a bit sad. As each student spoke up, they put a bandaid with their name on it across the heart. The kiddos then wrote about one way they’ll try not to hurt anyone’s heart and made their own scrunched up heart for their student portfolios. Thanks for stopping by and don’t forget to stop by Paula’s blog and link up! The Children’s Book Council of Australia host Book Week every year, here in the lovely land of Oz! It is, hands-down, my favourite event in the school calendar. Books are nominated, short-listed and finally selected in a range of categories, and schools are encouraged to read and celebrate these books with their classes. Each year has a theme, and this year the theme is Reading Across the Universe. Here in Melbourne we have a great school art supplier, Zart Art. Every year, Zart runs workshops for Book Week, selecting up to 12 books from the Book Week shortlist to provide teachers with art ideas and inspiration. This is the second time I’ve attended (the first being in 2010, my first year of teaching) and it is nothing short of AMAZING! Picture this – 28 teachers, 5.5 hours and 8 art pieces created. Each. It is so much fun! 3. An Iceberg (based on Sophie Scott Goes South) – this is really cool, it’s a model of an iceberg field on the way to Antarctica, and the tiny little orange dot is the Aurora Australis, and it’s designed to highlight the fact that we only see 1/10 of an iceberg above the water! 4. The Rocket (based on The Terrible Suitcase) – if you squint you might be able to see the tiny, pink suitcase hidden inside the rocket! 5. Aerial View Jigsaw (based on Herman and Rosie) – please excuse the poor quality of this piece; as my Dad commented upon seeing it – I’ve got NO spacial awareness! That said, this is probably my FAVOURITE story from the list so far. 6. Elephant Mobile (based on Too Many Elephants in this House) – we had to make 4 elephants, exactly the same, and trade 3 with people on our table. The red elephant is mine! 7. Lest We Forget Medal (based on A Day to Remember) – an ANZAC story, very beautiful and moving. 8. The Flying Coat (based on The Coat) – the quote reads “If we create from the heart nearly everything works, if from the head almost nothing.” (Marc Chagall) I think this is my new favourite quote! All that art-making and we still had time for morning tea and lunch AND I went shopping for art supplies for my classroom! My goodies: Supertac (like PVA/Elmer’s glue only thicker, so it doesn’t run and it sticks EVERYTHING! ), poster colours in warm, cool and fluro colours, an assortment of tissue paper (in block colours AND animal prints! ), giant crayons, paper bags with a gusset, boarder roll in silver and gold, 2 packets of Paper Magiclay (we used it for the icebergs, but it’s so handy!). 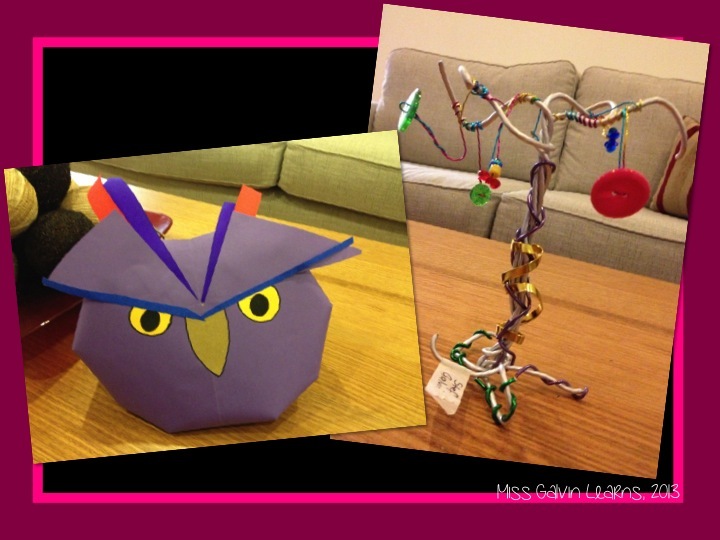 When modelling creations for students, do your second-best work – it’s ok to be a little bit different and NOT perfect! 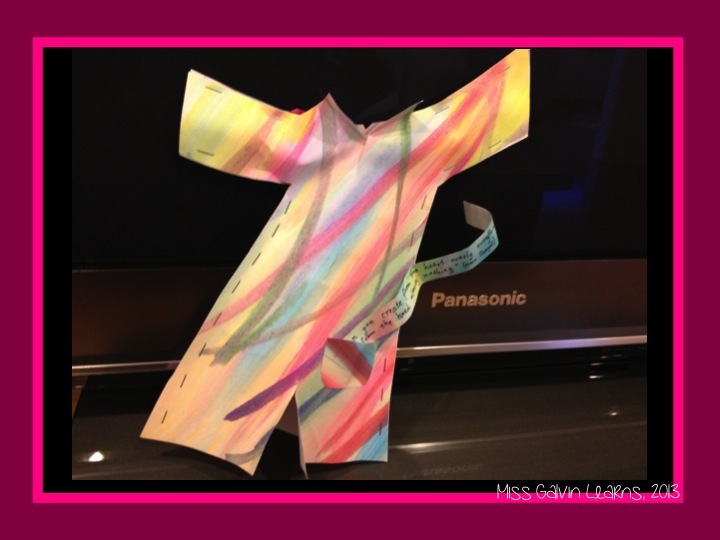 When folding a page and cutting for 2 exact images, tell the kids to hold the fold! So that was my very exciting day. What are your favourite book crafts? Feel free to leave links so I can visit your blog and pin ideas! So, my classroom library is about 95% complete. The only thing I haven’t done yet is label and catalogue my chapter books (which is next on my list) and my Levelled Readers, but I’m not too concerned about those because they’re not books I use for Guided Reading (our school has a collective collection of books which we use). So to celebrate being almost/nearly there/getting so close to finished I’m going to give you a bit of tour of it. Each category has a sticker code (look at me pretending to be an actual library!) on the front of the container and the back of the books that belong in each category. My theory is that it will help the students put things back in order. I’ll keep my fingers crossed. These are my ‘general fiction’ picture books that students can read (I have another small shelf of my special picture books) – there are 3 buckets, roughly sorted alphabetically by the author’s surname (A-F, G-P, Q-Z – which is just due to the collection of authors I had). Books that come in series – There Was an Old Lady (I collect the tradition stories, Lucille Colandro’s books and P. Crumble’s Aussie versions! ), Pete the Cat, Splat the Cat, Mo Willems, Mr Men, There’s a Hippopotamus on My Roof, Elmer, Hairy Maclary, Magic School Bus, Clifford, etc. 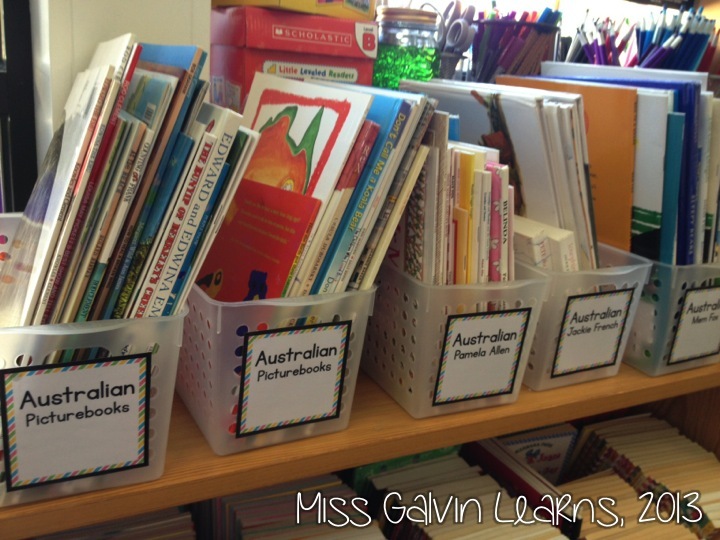 My ‘Australian’ books collection – general Aussie authors in 2 boxes, and then tubs for my all time favourite Aussie authors for whom I have a bad collection habit: Pamela Allen, Jackie French, Mem Fox and Nick Bland. Seriously, Northern Hemisphere friends – if you need recommendations on awesome Aussie authors you cannot go wrong with these wondrous books. If you want specific book suggestions just let me know – but there are some truly magical books. 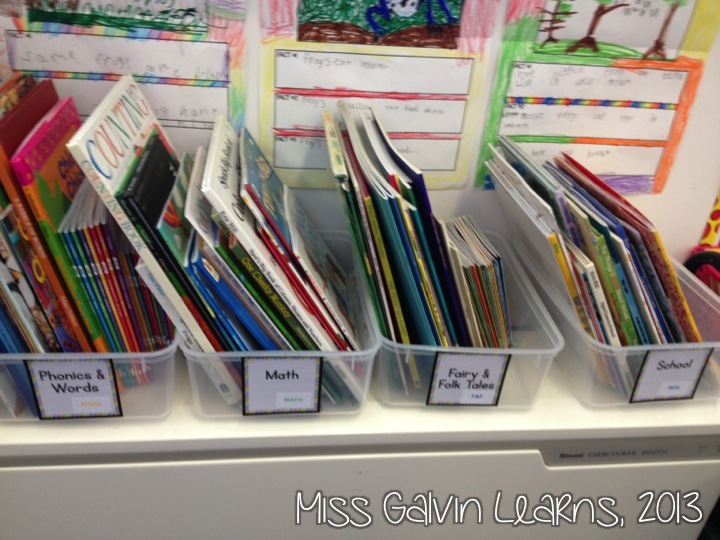 These are some of my ‘themed’ buckets – I collect Eric Carle and Dr. Seuss books like a crazy person. I’m a big Star Wars fan, so we’ve got those. My Grade 1 boys adore LEGO readers. There’s a few books that are based on movies/TV shows (Disney books, Ben 10, Pokemon etc), and a bucket for morals/feelings books (just because I have so many of them!). 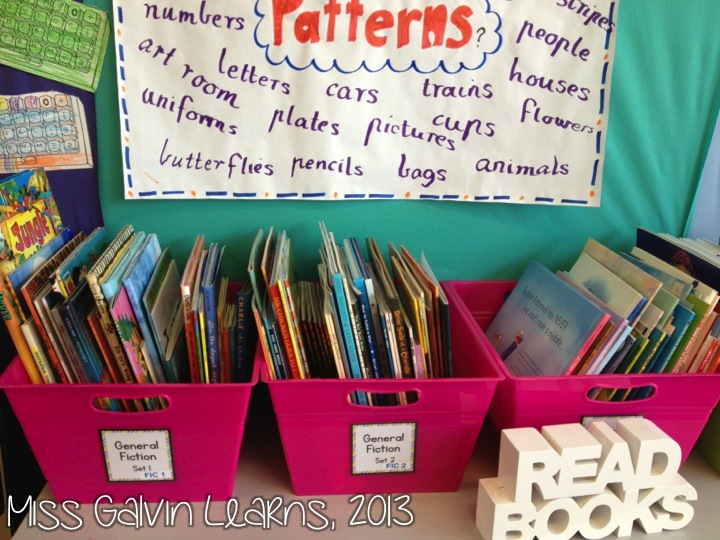 A few more ‘themed’ buckets – Phonics and Words (alphabet books, Little Mates series, first words, etc), Math (counting, numbers, etc), Fairy and Folk Tales and School-themed books (starting school, 100 days of school, etc). Yes, they’re sitting on my heater. Yes, I need to move them. I have no idea where, since I’ve literally run out of room in my classroom. I also have a little book stand that sits in front of the heater with books that fit our current them. Sigh. 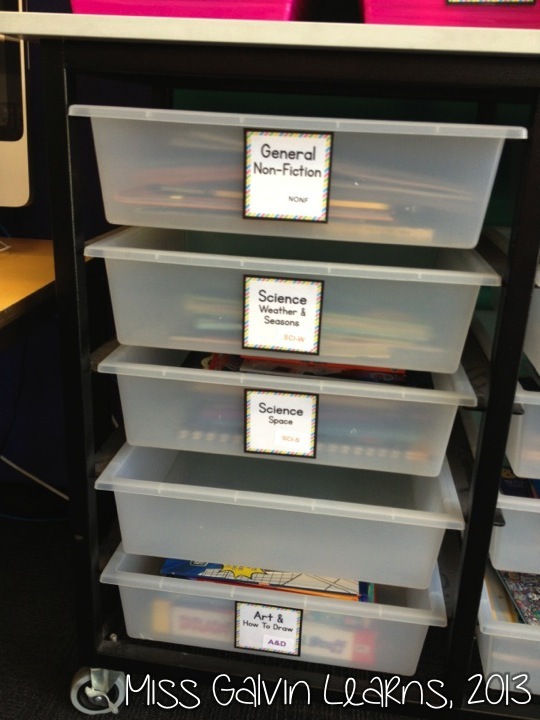 More themed buckets – predominantly non-fiction, but there’s a few left-over categories that didn’t fit anywhere else. 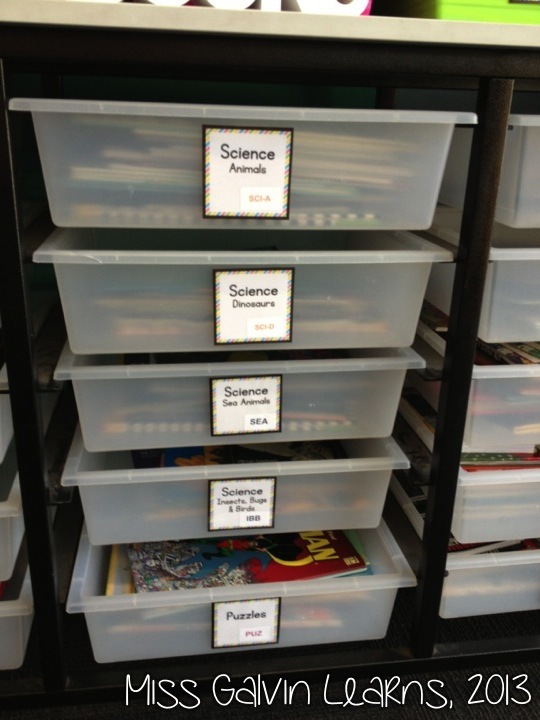 General non-fiction, weather & seasons books, space books, the empty tub will hold general science and science experiment books, and the final tub holds books on Art and How to Draw books. Lots and lots of books on animals – general animals, dinosaurs, sea animals, insects/bugs/birds – and puzzles (hidden pictures/mazes/look and find/etc). 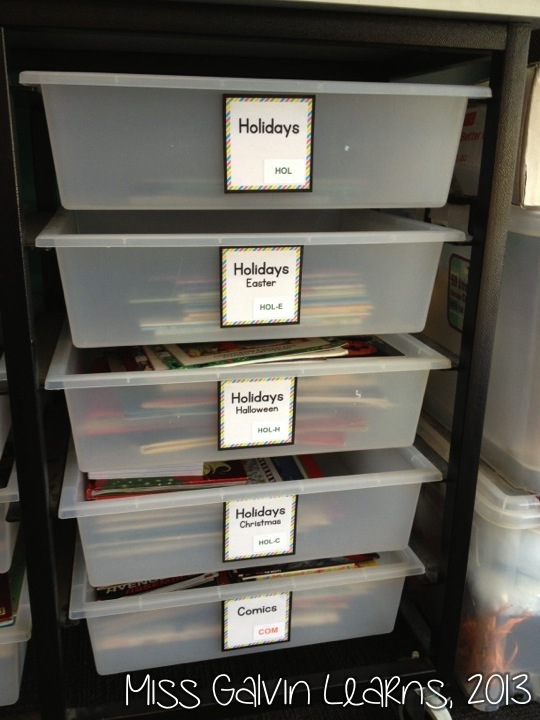 And my holiday book buckets – general holidays, Easter, Halloween and Christmas. Plus my comic collection for the kids – Batman, Iron Man, Spiderman, the Avengers, DC Super Friends, etc. 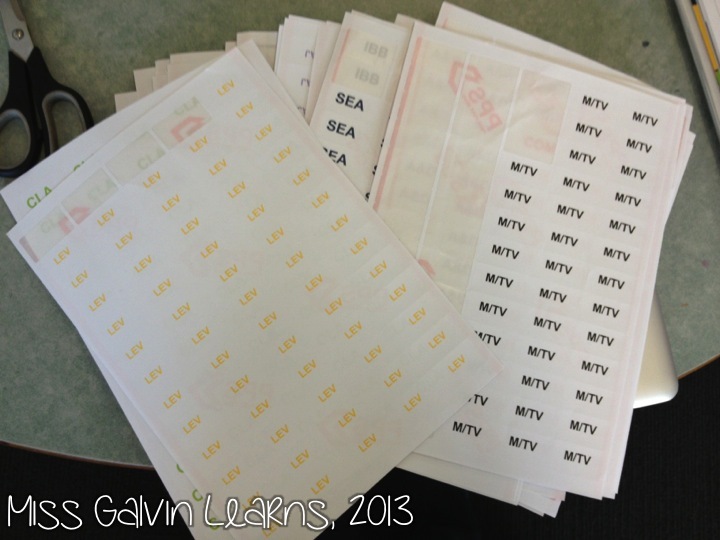 Here are some examples of my sticker labels for the back of the books. I purchased some generic brand labels (65 stickers per sheet) and used the Avery’s Design and Print Online function to print out simple labels that the Little Smarties can use to return books to their correct spot. I’ll also have containers for Book Hospital (for any books that need to be fixed) and the Lost Book Home (for books missing labels or for students who struggle to find the correct place to return books. So… that was my massive holiday project! I’m rather pleased with how it’s turned out, especially given the hours put in to get it to this stage. Thoughts? Opinions? Suggestions? Feel free to hit me with those! But, very quickly before I go, I have a reminder and a shout-out. Don’t forget to get involved in the Super Pack for Bundy fundraiser. It’s only available until April 30th! And the very lovely Chantelle, from Little Learners, is hosting her first giveaway! Go visit and join in – she has the cutest things in her TpT store!